Blog Tour Review: Blood Lines by Angela Marsons. I am super excited to be part of the blog tour for Blood Lines by Angela Marsons. As you might know I’m a huge fan of the Kim Stone series. You can also read a Q&A that I did with author Angela Marsons and my review of Play Dead, also in the Kim Stone series and The Forgotten Woman which is a standalone book. But today we are here to celebrate Blood Lines, the fifth book in the amazing Detective Kim Stone series. Blood Lines by Angela Marsons. If you’re a regular reader of If Only I Could Read Faster then you will know that I am a huge fan of author Angela Marsons and her Detective Kim Stone novels, so it was with much excitement that I started to read Blood Lines. 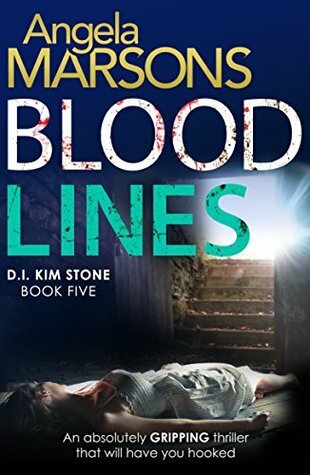 Blood Lines is book five in the Kim Stone series, and although Marsons has always been clear that they can be read as standalone books, as time goes on I think that the reader would definitely benefit from reading the series from the start. And frankly, if you didn’t you’d miss out on some brilliant books. Marsons is signed up to write a whopping 16 Kim Stone books and I have to admit that as much as I love the character I am unsure how Marsons will manage to maintain her for that many books. But thankfully she appears to be a long way from running out of steam with Blood Lines. Book number two, Evil Games, featured a character that was so brilliantly written that she scared the bejeebers out of me. it was one of the best portrayals of a sociopath that I had read. So when I heard that Alex Thorne was to make another appearance in Kim Stone’s life I was even more excited. For some reason, the relationship between Stone and Thorne just didn’t click for me in the same way and Thorne did not make my skin crawl as she had in Evil Games. This was disappointing for me. I felt that Stone dealing with Thorne and the chaos she was creating took up a lot of the story, but at the same time Stone was the lead detective on a puzzling murder investigation. For me, I think that it would have been better for the story to focus on one of these things, and to save the other for another book, as I felt that neither could be dealt with satisfactorily. Having said that Blood Lines is still a very good book and will no doubt satisfy the many Kim Stone fans desperately waiting for another book in the series. I was pleased that we got a teeny bit more about Stacey and Kevin, two of Stone’s team but I’d love Bryant and Stacey to feature more. Marsons is a skilled writer who is able to write in a way that makes the stories flow and feel so real. I’ve said it before but I do feel that each time a new Stone book comes out I get to catch up with a friend. The Detective Kim Stone books have been phenomenally successful and Blood Lines doesn’t let the team down and it gets a great 4.5* from me. Thank you to the publishers, Bookouture, for a copy of Blood Lines. How do you catch a killer who leaves no trace? A victim killed with a single, precise stab to the heart appears at first glance to be a robbery gone wrong. A caring, upstanding social worker lost to a senseless act of violence. But for Detective Kim Stone, something doesn’t add up. When a local drug addict is found murdered with an identical wound, Kim knows instinctively that she is dealing with the same killer. But with nothing to link the two victims except the cold, calculated nature of their death, this could be her most difficult case yet. Desperate to catch the twisted individual, Kim’s focus on the case is threatened when she receives a chilling letter from Dr Alex Thorne, the sociopath who Kim put behind bars. And this time, Alex is determined to hit where it hurts most, bringing Kim face-to-face with the woman responsible for the death of Kim’s little brother – her own mother. A totally gripping thriller that will have you hooked from the very first page to the final, dramatic twist. Blood Lines is out now and available from Amazon UK and Amazon US. Next postNaNoWriMo: Day ten update.